Heading for a ski resort in summer is a great way for thrill-seekers and nature-lovers to enjoy an active holiday. Levi – also known as Sirkka – is an attractive, compact resort that's surrounded by wild forests and fells, and has a superb range of year-round facilities and activities close at hand. 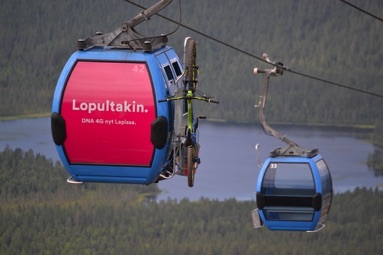 As it's up in the Arctic Circle, in Finnish Lapland, the summer months in Levi offer long, long days of light – meaning you can pack a lot of activities into a short amount of time. 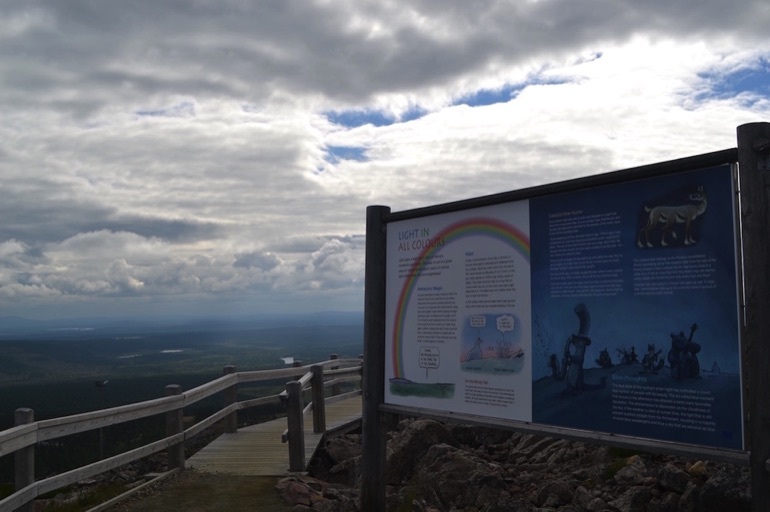 During the period of the Midnight sun – around 45 days in midsummer when the sun never dips below the horizon – it's possible to take nighttime mountain hikes or canoe tours on the Ounasjoki River. Active families should first head for the Activity Park, a short distance from the village centre. It's here, at the foot of the Levi fell, that you'll find the excellent Levi Forest Park. This high ropes climbing course will test your balance, agility, stamina – and nerves! Some of the challenges are nine metres from the ground, so you'll also need a head for heights. All of the action takes place within the forest, with obstacles built high up in the pine trees. The surroundings are really beautiful – we even spotted a pair of Siberian jays flitting through the trees. Despite the heights involved, we felt safe at all times – the supervision throughout our activity at the Forest Park was superb. We took the course as part of a small group, and after a thorough safety briefing we were ready to climb up to the starting point of the first course. The instructors were monitoring each group member at all times to ensure we were using the equipment correctly and weren't having problems. We navigated four courses, taking a total of around 90 minutes. The first course was fairly easy – the challenges then become gradually more difficult and higher from the ground. 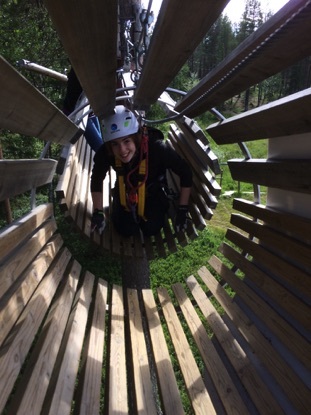 We clambered over rope bridges, along swinging wooden poles and across suspended wooden stepping stones. One of the memorable moments was crawling through a slatted wooden cyclinder, suspended high above the ground, then manoeuvring across a two-foot gap into a second cylinder. Each course ended with a zip-slide, adding an additional element of excitement to the experience. When our legs had stopped wobbling, we headed to the top of the mountain. This was made easy by the Gondoli2000 cable car, which whisks you to the summit in no time – offering spectacular views en-route. 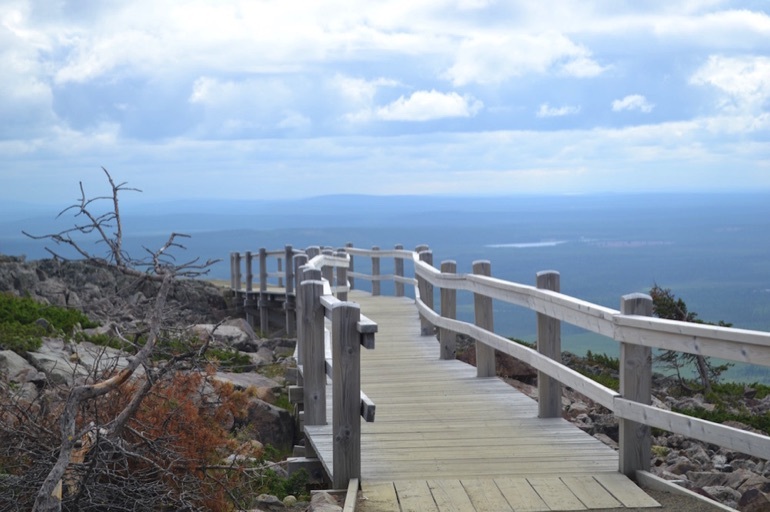 At the top, the excellent Peak Trail is a fully accessible walk around the summit that can be easily negotiated by wheelchairs or pushchairs. The panoramic views in all directions are stunning. 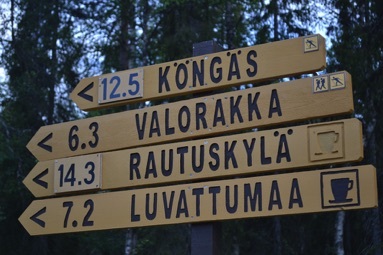 Along the way, information boards give a fun insight into the region's weather, Northern Lights and Finnish folk tales. There are several resting places with benches, where you can admire the view. 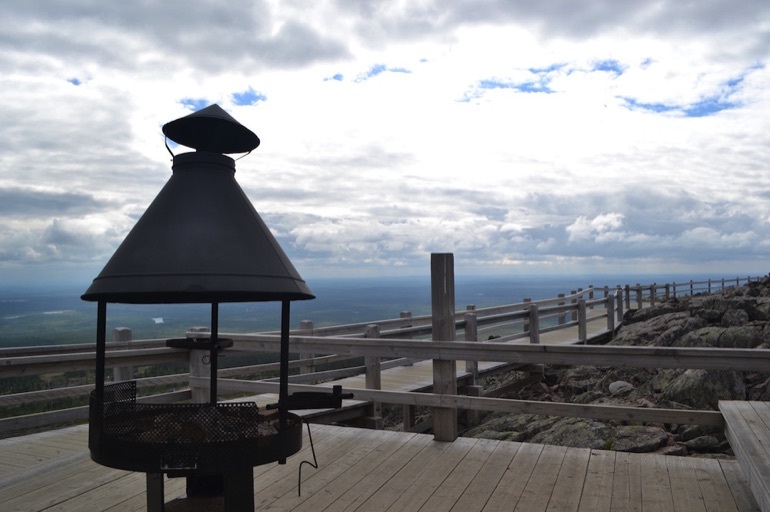 And, if you come equipped with sausages, you can cook your own lunch up here on the fire pit. There's a large, covered shelter too – and firewood is provided so you only need to remember to bring food and drink. 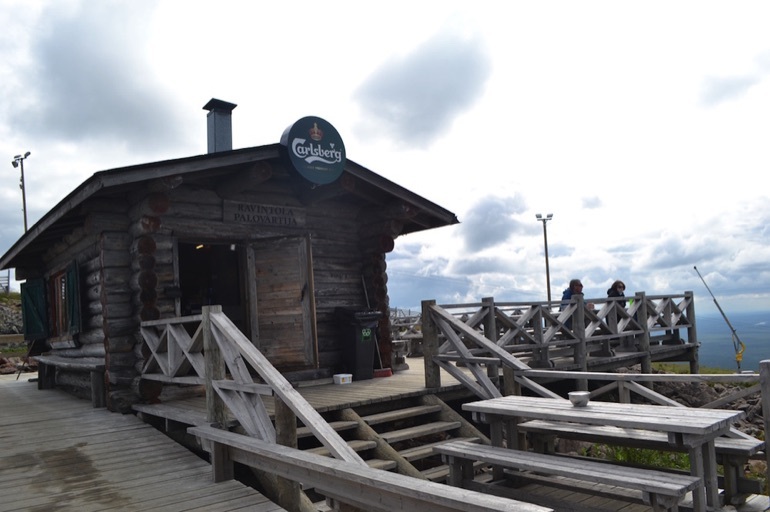 If you forget to bring lunch, don't worry – there's a super mountain café to visit after completing the trail. With outdoor tables to take full advantage of the panorama, the café offers delicious freshly-baked cinnamon buns and black pepper donuts to accompany your coffee or hot chocolate. 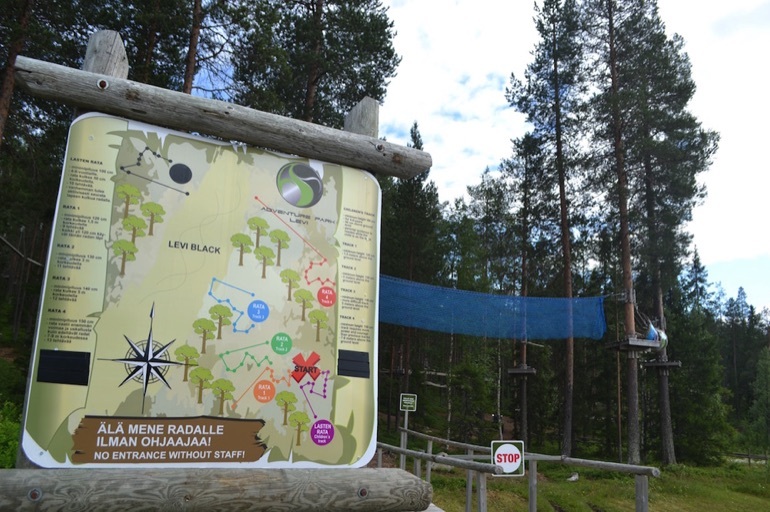 The entrance to Levi Bike Park is just opposite the café and is a thrilling way for cyclists to explore the mountain. Featuring downhill trails with vistas across the surrounding Lappish lakes and forests, this is an easily accessible mountain bike adventure – bikes can be carried up on Gondoli2000, so you can keep all your energy for the downhill fun. 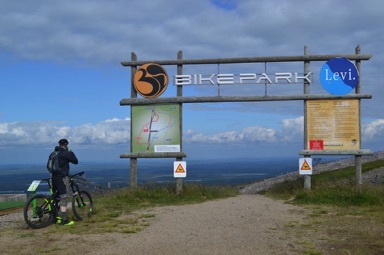 If you don't have your own bike with you, quality mountain bikes can be hired at the Activity Park. There are routes to suit all levels of experience – including the easy 3.3km Blue Groove trail, that's suitable for beginners, or more challenging trails featuring jumps and other adventurous elements. For a more sedate cycling experience, many people take advantage of the green village bikes – an innovative, eco-friendly system that allows visitors to cycle around the village and surrounding areas for free. There are green village bikes at various locations around the resort, including at major hotels, the Activity Park and Zero Point – the main equipment hire centre, in the heart of the resort. The system is easy to use. Just register with photo ID, and you get the bike for 24 hours – you can return your bike to any of the numerous drop-off points across town. 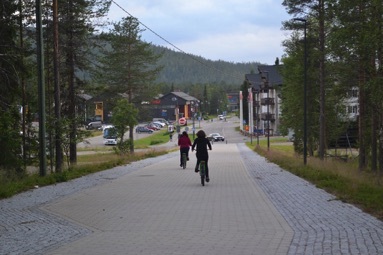 Using the bikes is a great carbon-free way to get around Levi. The route from the village centre to the Activity Park is an easy pedal along a pleasant cycle lane, part of which runs alongside a lake. For exploration further afield, there are also various bike-friendly trails that lead through the surrounding woodland. 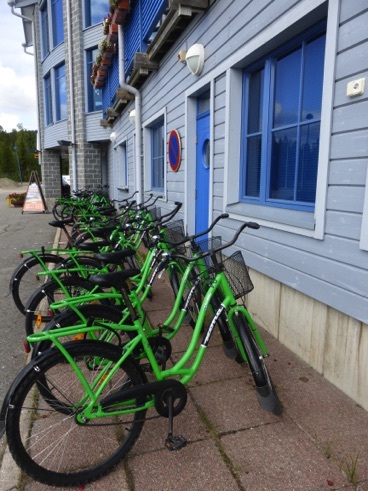 The village bikes system is just one eco-friendly initiative in Levi that's helping visitors to the resort reduce their impact on the environment. Sustainable tourism is evident throughout the town, and includes the key elements of energy efficiency, nature conservation and design and materials that take Lappish culture into account. Visitors are encouraged to switch off lights, and to support local food producers, artists and craftspeople by buying their products. There are various eco-points around town that offer recycling facilities, making it easy for guests to recycle their rubbish. And the drinking water that comes from the taps in town is pure, clean and fresh – guests are encouraged to drink this, rather than buying plastic bottles of water. 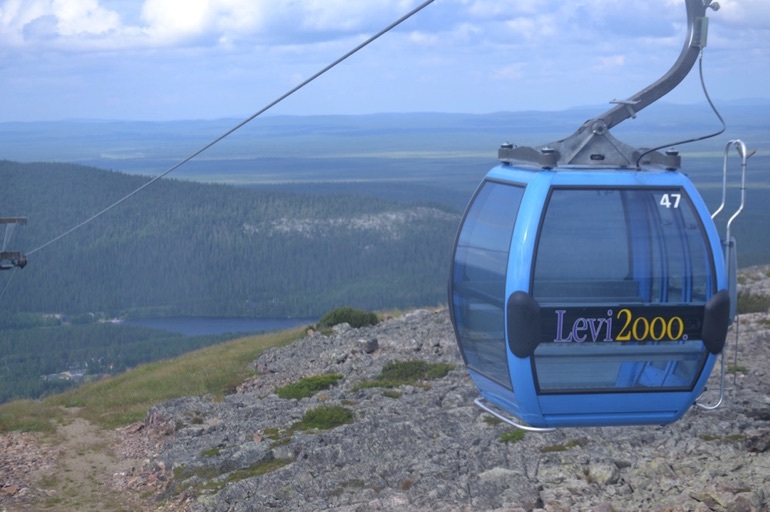 Exploring and enjoying Nature is at the heart of any trip to Levi – and the town's sustainable tourism initiatives are working hard to preserve and protect the natural beauty that is there for everyone to enjoy. If you're visiting in summer, Levi has some excellent – and great value – accommodation choices. 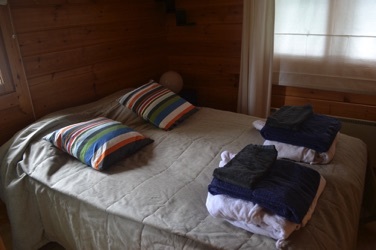 We stayed in a centrally located, ski chalet style apartment. With wood panelling, comfortable sitting area, views of the surrounding fells and a private sauna, this was a wonderful home from home that was great to come back to after a full day of activities. There was plenty of space for a large family, with a separate double bedroom, and upstairs galleried sleeping platform – that also had a second sitting area, so that the children could spread out and relax. A well-equipped kitchen meant we could prepare our own meals if we were too tired to go out to eat. Our apartment was conveniently located. Zero Point – where you can borrow green village bikes or rent other equipment such as fat bikes, mountain bikes or Nordic walking poles – was just across the street. Supermarkets and a good range of restaurants and souvenir shops were just a short walk away. The apartment was also close to a number of walking trails. Marked trails of different lengths lead through the nearby forests, and just across the road from the apartment we found wooden steps leading up the fell side to a spectacular viewing point – quite a climb, but worth it! 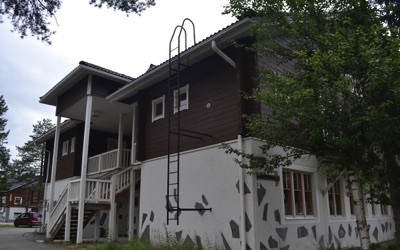 Accommodation, activities and tours can be booked at www.levi.fi/en.